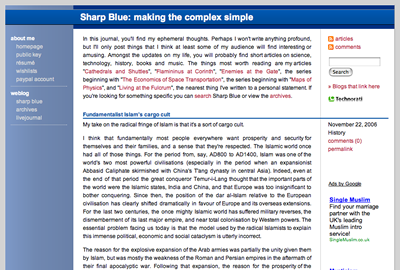 As you have probably noticed, Sharp Blue and most of its associated pages have been given an entirely new style over the last few days. There are still some rendering glitches in Internet Explorer 6 - I would strongly advise anyone still using it to switch to Firefox, Safari, Camino or at least Internet Explorer 7 as the CSS/DOM support in IE6 is utterly broken - and the pages don’t render correctly in narrow windows. Most of the images look wrong, as do the more complex layouts like my Review Queues. 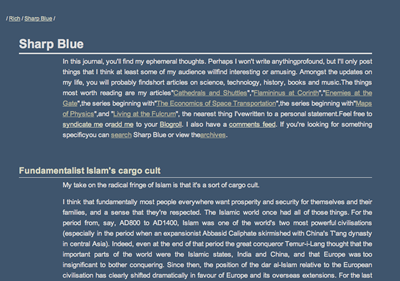 There are also no links to other weblogs and friends’ pages yet. All of this will be fixed soon. The main change is a shift to a black-on-white colour scheme as the old scheme was quite a lot harder to read - a drawback to a site focused on text - and looked a little drab. This time around I’ve allowed mechanisms to intrude a little into the layout to simplify navigation, and allowed myself the indulgence of the occasional gradient tint. I hope you think these changes are a step forward. retty much nothing seems worth thinking about. My life's been completely dull , not that it matters. I've just been staying at home waiting for something to happen. I have moved a comment by Annette about Labyrinthitis to the thread on that subject.